Preheat oven to 400°. Cook bacon until crispy, 8 to 10 minutes, then transfer to a paper towel-lined plate to drain and chop into small pieces. Cut zucchinis in half lengthwise. Using a large metal spoon, scoop out seeds from the insides, then cut each half into three to four pieces. Transfer zucchini to a large baking sheet and toss with olive oil. Season with chili powder, cumin, salt, and pepper. Bake until slightly tender, about 5 minutes. 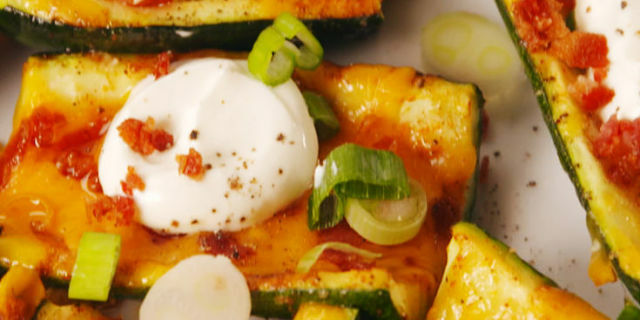 Top each piece of zucchini with cheese and bacon. Return to oven and bake until cheese is bubbly and zucchini is tender, about 10 minutes more. Garnish with sour cream and green onions.